Stitches Midwest - Worth It Every Time! I first heard of Stitches Midwest in 2013. I had recently opened my Etsy shop and just been accepted to appear in the upcoming One Of A Kind Show in Chicago. I knew it was time to step it up a notch and fill in some holes in my self taught crochet knowledge so I searched for area events and voila... my discovery of Stitches Midwest. As luck would have it, Drew Emborsky (The Crochet Dude), who was a big inspiration of mine and a name I recognized, was teaching a class, so I knew it was serendipitous. I enrolled right away and was grateful for a local find! While it seemed to be more a knitting event, I had a blast and the class I enrolled in was simply fabulous. There were several A-Ha! moments and "oh man that's HOW you do that" light bulbs going off in class with Drew. I learned so much and could not have been happier and, in fact, we are friends to this very day! 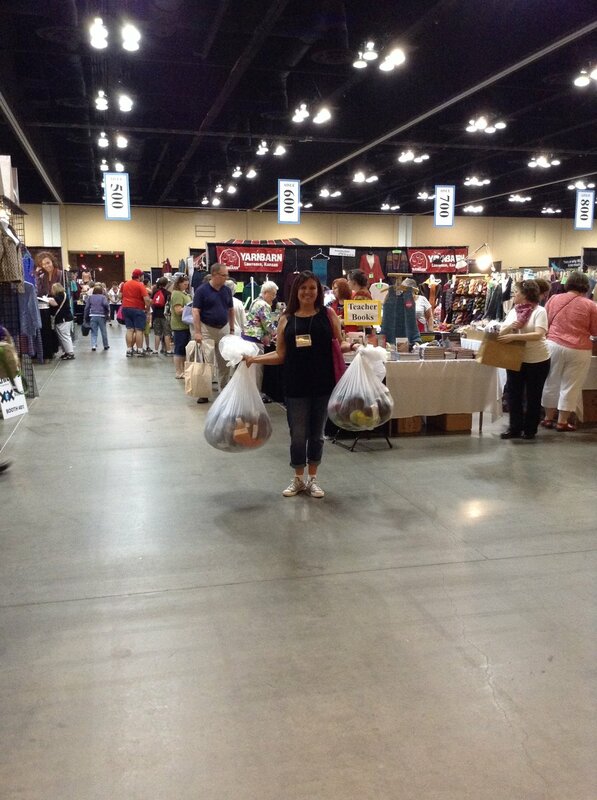 I also shopped until I dropped (for real) in the market and discovered all sorts of tools, fibers and delights. I learned Tunisian Crochet and discovered the Big Alpaca Bump from Becca Smith. 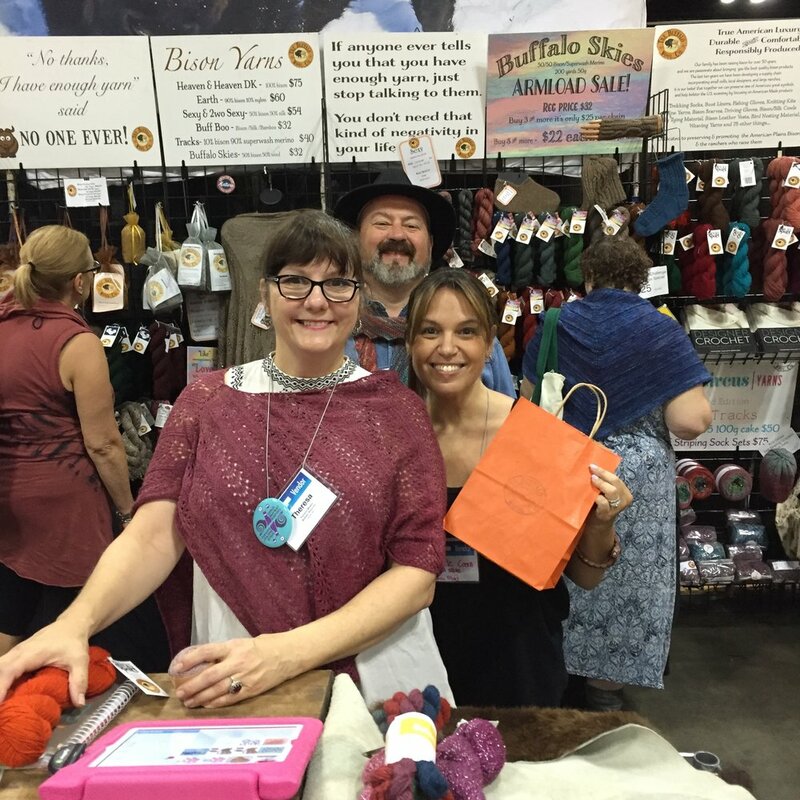 That was also the year I met indie dyer Katie of Dragonfly Fibers, who I have worked with ever since. A total success! 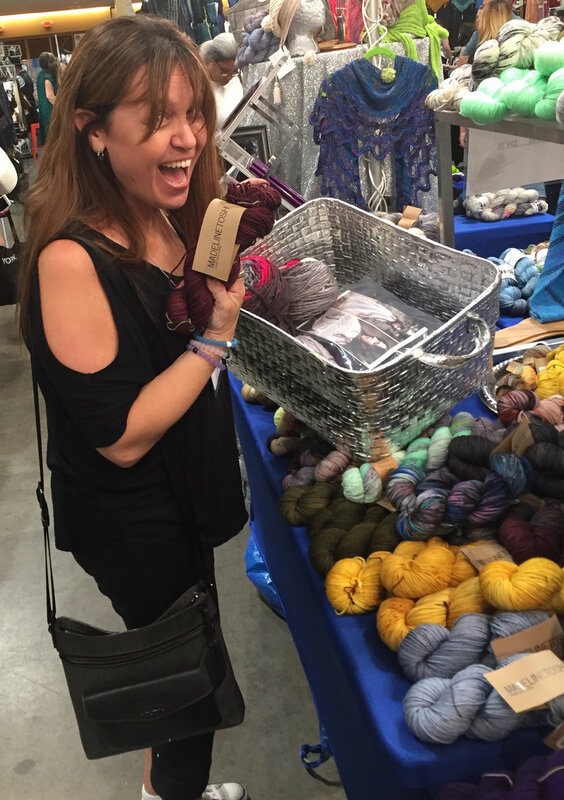 In 2014 I returned with Katie to grab my enormous haul of incredible hand dyed delights she made for me. For real... it was So. Much. Yarn. I wandered a bit and got to discover Karen and her company Fringe Supply Co with her lovely rosewood hooks and notions for fiber folk. That was also the year I met Stephen West and Steven Be, which launched our fiber affair. (more on that later). So all in all... another success! I had to skip 2015 due to being on location for a shoot so was super excited to return in 2016, even though the event itself somehow seemed a bit smaller. My fiber business was taking off and thriving, I had just launched this blog and was dialing in to go full time and full steam fiber dream chasing so I had a feeling it would be special. It was more special than I could have imagined. Due to my schedule, I wasn't able to take any classes but was able to see some amazing humans and tear it up in the market. I got to spend some time with The ShibaGuyz Shannon & Jason Mullet-Bowlsby in person. We had basically become social media besties at that point so being in the same room was just too fun. And of course, Jason & I landed in a deep discussion about photo apps. I mean, no one was surprised by this. 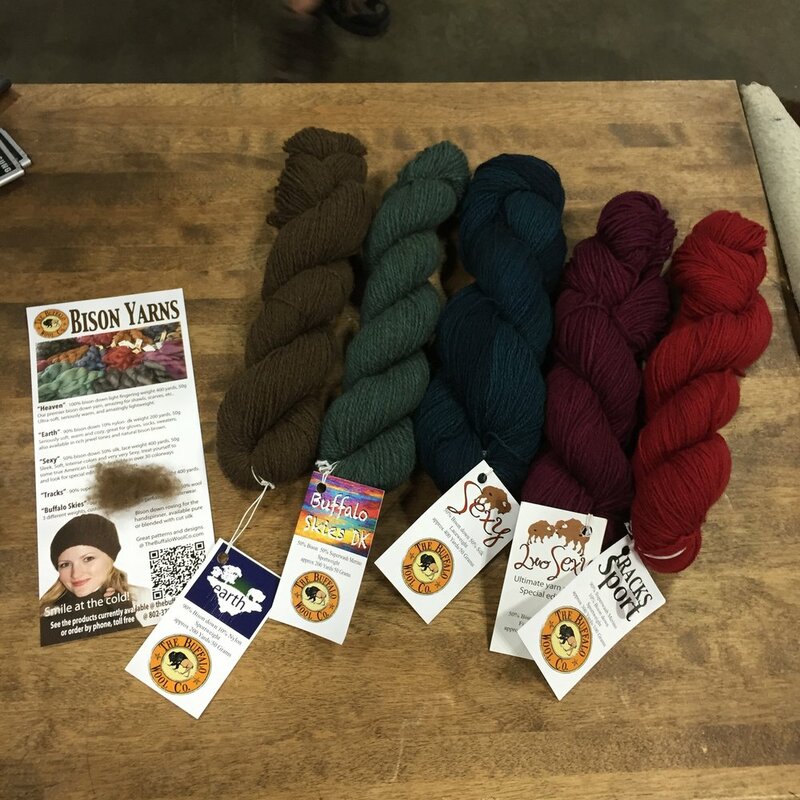 And HUGE Bonus, Shannon introduced me to Theresa & Ron of The Buffalo Wool Co.. Not only are they two of the nicest human beings I have ever met, they have an incredible story and fiber. You know I didn't leave empty handed. Please check them out - you will NOT regret it. Then I made a mad dash over to Steven Be's booth for what can only be described as fiber fabulosity and the birth of our fibar antics and mayhem! At this point, I had to resort to using my auxiliary shopping bag because the yummy fiber finds were just to good to leave. I needed to get All. The. Yarn. It was my introduction to Freia Fibers and I have never looked back. And of course there's always time for fun fiber antics with Steven. 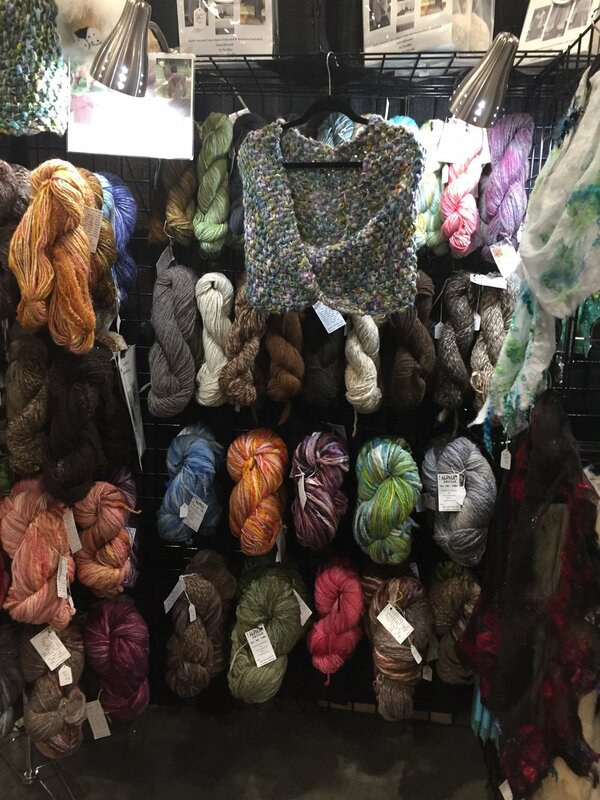 I hopped over to Yarn Culture New York where I met Patti and discovered her amazing fibers, including Crave Yarn. 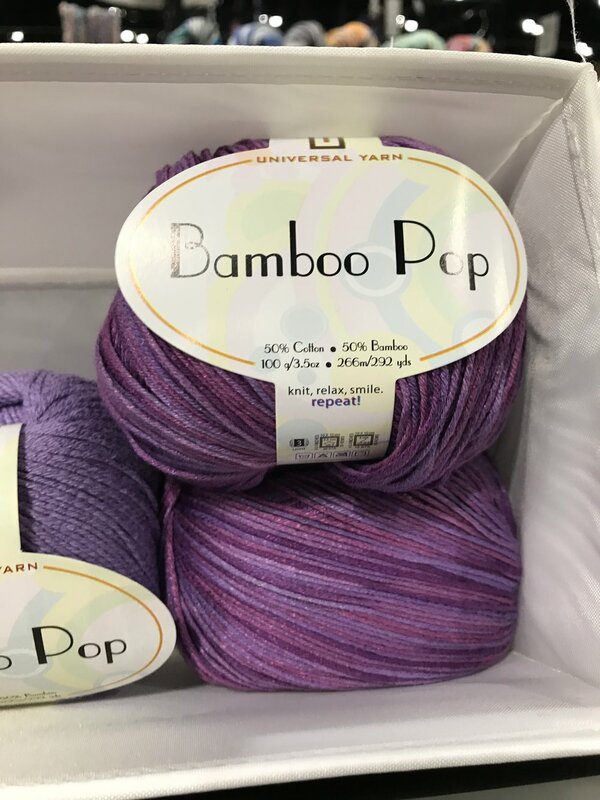 I was immediately in love with the colors and textures of Crave Yarn, appropriately named by the way because I was craving it on sight and it was SO SOFT! I also had to grab some of her Rosy Green Wool Cheeky Merino because it was very interesting and a bit heavier than most DK weight fibers and the colors are so vibrant. Total score! A quick haul to the car to unload the day's finds and then a yarn break to recharge. It's a good thing I keep my picnic blanket in the car. Convention entrance seemed to be a good place to park for a minute. It's a good thing I keep my picnic blanket in the car. Fully recharged I was super excited to stop by and see what the gals at Dragonfly Fibers had for me this year. 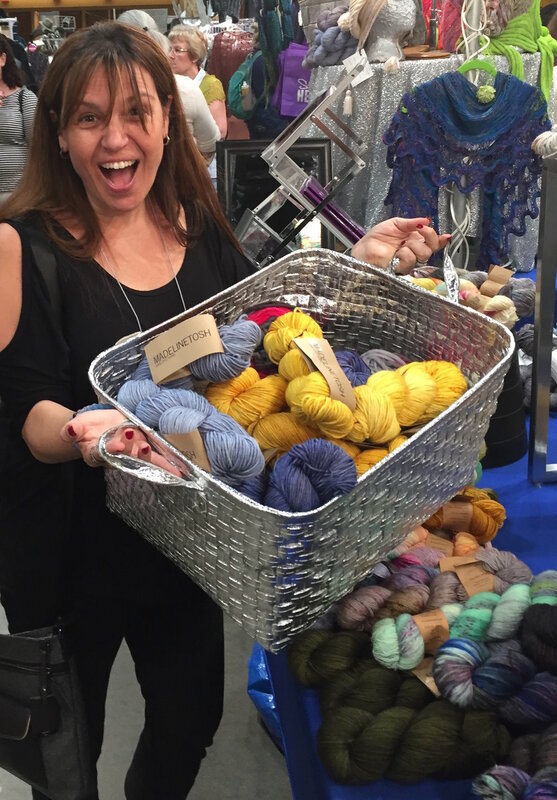 I also finally got to meet Nancye, the other half of the magnificent dyeing duo! And I was not disappointed. Normally I am drawn to their bulky Super Traveller but the new gradient kits had me swooning over worsted & dk weight like never before. Their colors are always so vibrant and fun. Before heading out, I wanted to stop by the Halos of Hope to thank them for all they do. I have been partnered with Halos of Hope since 2014 to make and send chemo caps to cancer centers nationwide. You can read the full story here. Even though I had partnered with Halos for years, I had never met Pam in person. It was such a treat to see her there. She is spunky and fun and fabulous and genuine and exactly all the things you can imagine of such a kind person. I was blown away by this beautiful woman and sharing a few minutes with her. 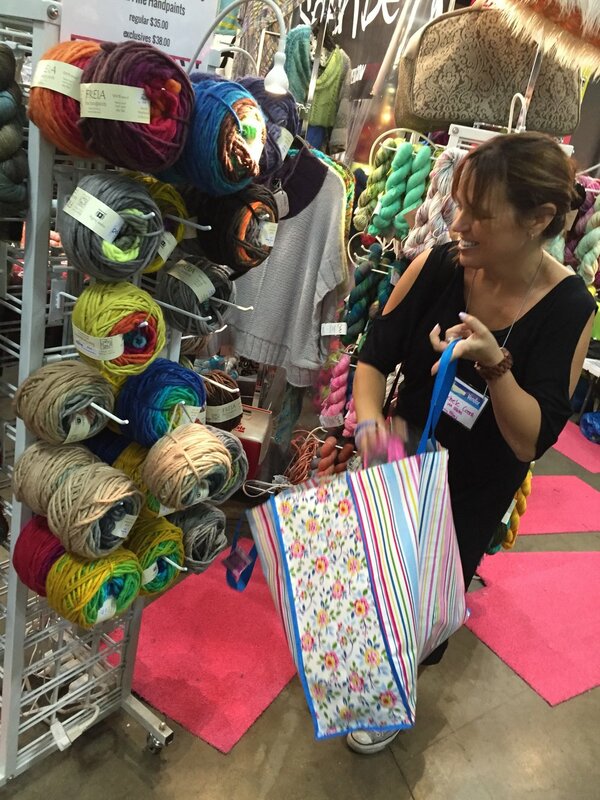 We bounced around Stitches Midwest booths and laughed and it was so much fun to connect. The absolute highlight of my day and a perfect way to cap off Stitches Midwest 2016. When the Early Bird registration email for Stitches Midwest 2017 arrived I was ON IT! I was particularly excited when I realized Shannon & Jason (The Shibaguyz) would be back teaching the classes I missed last year. SCORE! And they added Jason's photography class. Um... HELLO please take my money and sign me up! Learning how to measure correctly! The Alter to Fit class was great to fill in some gaps in my self taught design knowledge. I also learned so much from hands on measuring and what I call Designer Math. If you ever want to get a pattern but Alter it to Fit, this is the class to take. If it comes to a town near you sign up, you can also get started online here. Fab Crochet Fabrics was so good, though it did fly by. The class was small enough that Shannon & Jason taught a bit more conversationally than by following a strict layout. I feel like we could have gone on all day. It was such a joy to discuss and learn about texture, drape and how to determine the right yarn and stitch for your project. What a great thing to be in a room full of creative people on the same page as you. I just didn't want the class to end. THESE WERE MY PEOPLE! The photo class was great but definitely too short. What was super cool is that it was interactive. Learning stances. Learning about lighting. Not from seats but from being up with our cameras or phones and doing it. It was great to have a photography class that focused on FIBER. What we are trying to show and feature in our work. So many great tips tricks and hacks too that I am blown away. OK... so that is the classes. Now on to the market... and Oh - Emmmm- Geeeeeeeee. If you follow me on Instagram you saw the awesomeness as it happened! So glad Mama Christa was there and I got to say hello! 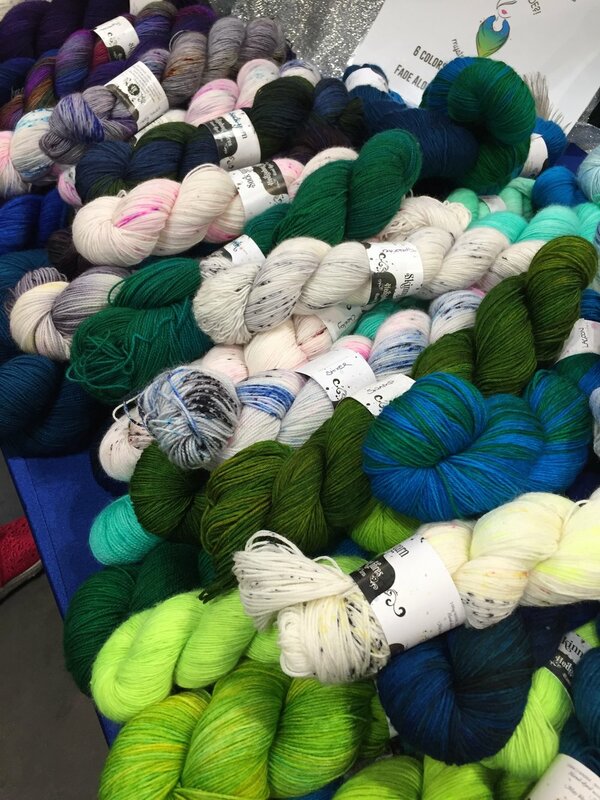 One of the best parts of Stitches Midwest is seeing fiber friends who are too far to see often. One of my faves is Steven Be. At first when I didn't think I would make this year's event missing out on a shopping day with Steven be was the worst part. But then when I was able to attend, well it was of course a highlight. His whole team, Missy, Pippin, Erin and the King Bee himself, are all so much fun to play yarn with. 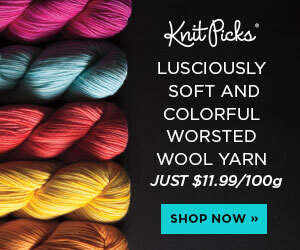 And they curate some of the most FANTASTIC fibers that make me swoon. Colors and texture... it is a sensory overload upon arrival in the best way. I may have stopped by a few times over the course of the event, going back for more each time. I even got a new Blue Sky Kit for the most incredible cocoon I cannot wait to make. Speaking of seeing fiber friends, of course I stopped by Dragonfly Fibers a few times and may have left with 2 large bags of yarn. Thank you Nancye! I made my way over to Yarn Culture New York to visit with Patti and see all her new fibers. Oh my goodness, her offerings are always so classic and modern all at once. It is that perfect balance. The new "joy" weight of Rosy Green Wool Cheeky merino is so fabulous and is indeed full of joy. Of course I had to grab some in shades of blue and cannot wait to design something fabulous... for the Fellas! We had time to chat a bit and cook up a few new ideas together so stay tuned... because some fun things from us are coming soon. 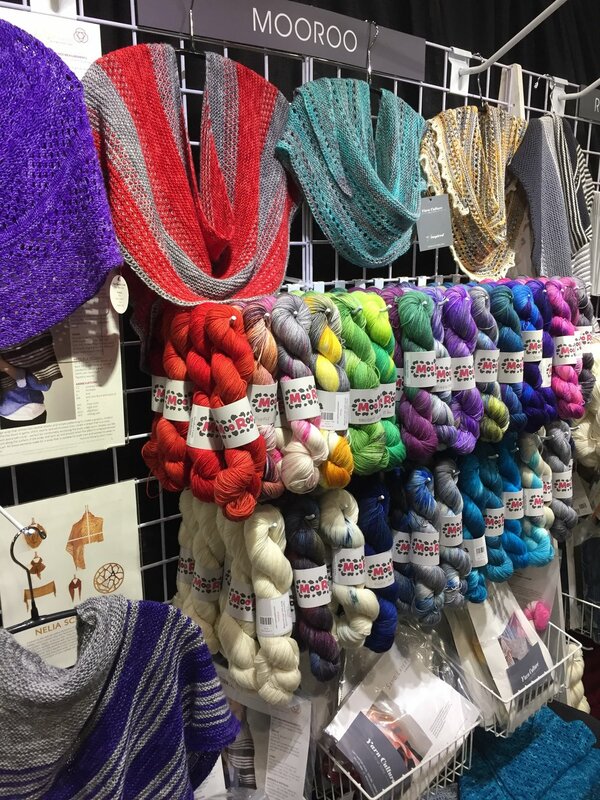 The other great thing about Stitches Midwest is discovering all of the amazing new Fiber Friends. I found an incredible hand carved size S Crochet Hook when I met Sandy & Dennis from S & S Camelid Co. They have an Alpaca Farm and sell the big Bump's of yarn! Rugs will be made!!! I also met Dami from Magpie Fibers. Dami gets me. I had breezed by Magpie on my first trip as I must have been in a daze and missed her offerings. Thankfully she tagged #StitchesMidwest in an Instagram post and it caught my eye as I searched the hashtag. So I made a point to head to her booth. After staring at her fibers for what must have been an eternity, she came over. Clearly I needed assistance lol. 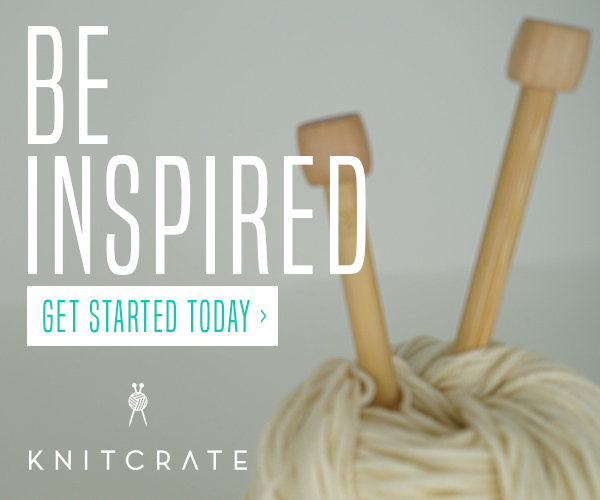 You know how it goes... you see a fiber you REALLY want to work with but you don't have a plan yet? Lord knows I don't need to grow my yarn stash. So the staring game begins. Between me and the yarn. It tells me to take it home and I tell it I must first devise a plan. Dami could see I was clearly in over my head staring down her incredible offerings so I am glad she came over to introduce herself and help. I think what made me an instant fan of hers was that before she asked me if I needed assistance she offered to join me in the stare down. THIS IS SOMEONE WHO GETS IT! So we stared. Then we chatted. Then she helped me come up with a plan and I cannot wait to show you what I make. So many incredible finds. Over the next few months I will be showing you some close ups and launching special collaborations and projects that showcase some makers and finds from the Stitches Midwest market. We have some really special stuff planned for you guys and you know that means a few AWESOMESAUCE giveaways too. Click the photos below to get to the vendor site of some of my fave finds. If you have ever considered attending an event like Stitches, I cannot recommend it highly enough. Being around YOUR people. Supporting small businesses. Learning and meeting fabulous humans. It's been 5 years since my first Stitches Midwest. Some years I took a class and some I didn't. Every year was different. Some vendors the same and some new ones to discover. Always awesome. Always worth it. And of course... when you go... make some time for antics and a hat lesson with Steven. Enjoy. How To Wear a Hat with Michele & Steven Be from michele on Vimeo. Never miss an event, a technique tip or free pattern post. All photos, designs, and patterns are copyright of Stitch & Hustle unless otherwise noted. Please do not repost or claim my content as your own. This site displays third party ads and contains affiliate links. Michele of Stitch & Hustle is a participant in the Amazon Services LLC Associates Program, an affiliate advertising program designed to provide a means for sites to earn advertising fees by advertising & linking to amazon.com. Read policies & disclosures here. Thank you for being part of the community!